What Day Of The Week Is May 21? 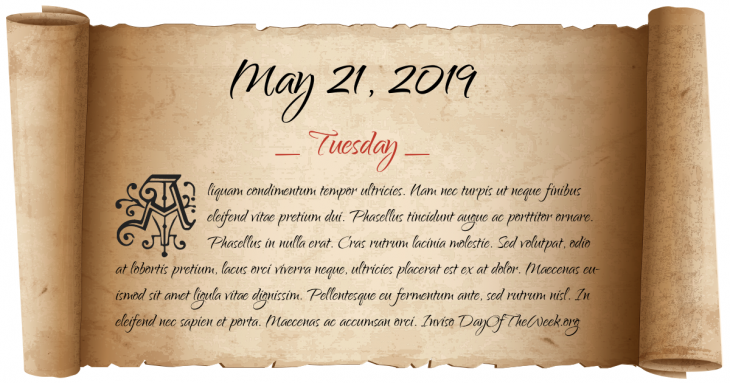 May 21, 2019 is the 141st day of the year 2019 in the Gregorian calendar. There are 224 days remaining until the end of the year. The day of the week is Tuesday. Syracuse, Italy is captured by the Muslim sultan of Sicily. Pope John VIII gives blessings to duke Branimir and to Croatian people, considered to be international recognition of the Croatian state. War of the Pacific: Two Chilean ships blocking the harbor of Iquique (then belonging to Peru) battle two Peruvian vessels in the Battle of Iquique. The American Red Cross is established by Clara Barton in Washington, D.C. The Canadian National War Memorial is unveiled by King George VI and Queen Elizabeth in Ottawa. Civil unrest in Rosario, Argentina, known as Rosariazo, following the death of a 15-year-old student. Michelangelo’s Pietà in St. Peter’s Basilica in Rome is damaged by a vandal, the mentally disturbed Hungarian geologist Laszlo Toth. Irish Republican hunger strikers Raymond McCreesh and Patsy O’Hara die on hunger strike in Maze prison. In Miami, Florida, five abortion clinics are hit by a butyric acid attacker. Who were born on May 21?